Sometimes finding a good parking space for your car can make or break your day. We’ve all had those days where we’re trying to find a parking space near a client’s office or a conference centre, and we end up having to park two miles away from our destination. How many arguments happen on a daily basis because someone nipped into someone else’s bay after they’d been waiting for five minutes? Wouldn’t the world be a simpler and more democratic place, without parking markers, allowing anyone to park exactly where they like? Although this may sound like a dream situation for many tired and weary vehicle owners who have had a lifetime’s fill of having to wait in line for a bay to become available, what would it really be like? Imagine you run a supermarket or a large sports centre with an equally large car park. It’s human nature for your customers to want to make the walk from their cars to the front doors as short as possible – especially if there’s cold weather or even rain on the scene. What would it be like however if everyone wanted to get the space closest to that all important entrance and there were no ordered car parking bays – just a giant black tarmac expanse that offers an endless freedom for anyone to place their vehicle anywhere? A truly libertarian proposition until you finish your work only to find that your Audi is parked six rows deep and you’ve got no chance of getting home for at least 12 hours, whilst the rest of the cars slowly move away and you shoo off other drivers from parking anywhere near your exit route. In many company car parks, the spaces reserved for the senior directors and the CEO are clearly marked with their initials. The reason for such bays could simply be down to the fact that top level executives don’t arrive at work quite as early as the drones. Ordinary workers know that there is a heavy price to pay should they decide to ignore the business’s hierarchy and usurp a bay reserved for one of the upper management. Imagine however the chaos that would occur if there were no such markings and these high flying big-wigs couldn’t get a space near the office door in the morning, afternoon, or whenever they decided to arrive at work. It simply wouldn’t do – you’d probably see some strange behaviour - like their PAs standing out in the car park with a broom, pushing away other employee’s vehicles in order to keep their boss a good space on the tarmac. Although some people buy into the conspiracy theory that parking schemes are only put in place by councils to make money from drivers, certain roads and thoroughfares need to be kept clear at all times. If you’re an employed motorist who has to contend with the rush hours produced at either end of the day by our country’s clocked in nine to five business regime, then you’ll already know that the UK’s roads are truly at heaving point. What would it be like without these vital yellow lines as you travel too and from your place of work? Throw a petulant somebody into the mix, who just decides to park up on a main road to pop into Tesco’s for some milk, but then meets a friend who they haven’t seen for a couple of years, upping their stopping time to thirty minutes and you’ve got a ten mile tail back. A world without double yellows doesn’t bear thinking about for many commuters. If you run events in the countryside then you’ll know that parking markers aren’t just painted symbols on tarmac. 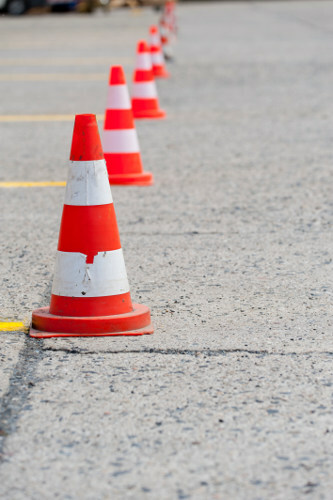 There are all kinds of bollards, ropes, barriers and car parking posts that can be used to peg out an impromptu car park over a few hours for a country fete or a festival. Whilst the parking spaces created by this apparatus are important, the driveways marked out by the clusters of bays are vital. If you’re an experienced hand at this game you’ll know that this allows you to lay down woodchip, special boards or even metal tracks to protect high traffic areas of ground and stop it from becoming an inescapable mud trap where cars can get well and truly stuck. If drivers were permitted to find their own parking space and simply drop their vehicle wherever they liked in such green and natural lots, then this could lead to some very dirty problems, with cars getting stuck in the mud for a very long time. We’re sure that if there was a lack of parking markers in the world, then people’s general ability to be considerate towards other drivers would be the next thing to go. It wouldn’t be long before vehicle owners would start placing their cars right in front of people’s driveways as they park up for work, blocking the home-owners in for the duration of their day and no doubt stopping them in turn from reaching their jobs. We’re sure that what this would remove from society in terms of the frustration created by a lack of decent parking bays would soon be replaced by outlandish acts of aggression from home owners towards drivers who’d blocked them in their house and prevented them from getting to their place of employment. We hope this article has firmly parked any idea that today’s world of parking spaces, bays, posts and barriers could in some way be fixed by these essential items being removed from society. Even though we might not like having to deal with the waits, the endless scouring for a space, and the payments and fines, if you really think about it – the alternative reality is really a whole lot worse.